Planners presented early concepts for a new Market Street to the public yesterday, moving the discussion forward on revitalizing San Francisco’s grand boulevard with features like car-free zones, raised bike lanes, faster transit, and more inviting public spaces. The ideas and visualizations, which are available on the Better Market Street website, were presented by planners as starting points to explore. Many of the concepts are hallmarks of the world’s greatest streets, and planners in the multi-agency effort are aiming to adapt them to Market using a swath of survey data about how the street is used. The increasingly popular idea of removing private autos from lower Market could come in various forms, ranging from additional forced turns for cars in both directions, to a car-free zone near the Powell Street cable car turnaround, to a full ban on cars as far west as Octavia Boulevard. Staff fielding public feedback said the proposals have met mostly with support, with concerns focused largely on how to best implement car prohibitions in ways that are enforceable and don’t shift traffic congestion problems to other streets. Similar experiments have proven successful on New York City’s Broadway and Copenhagen’s Nørrebrogade, said Jeff Risom, a planner on the project with the Copenhagen-based Gehl Architects. Like Market’s forced turns at eastbound Sixth and Tenth Streets, officials in those two cities used pilot projects to find the best fit for car restrictions. 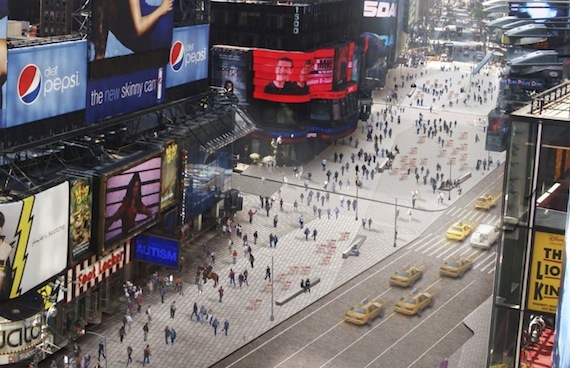 In the summer of 2009, the NYC Department of Transportation (with the help of Gehl Architects) removed cars from a section of Broadway in Times Square, turning it into a pedestrian plaza. 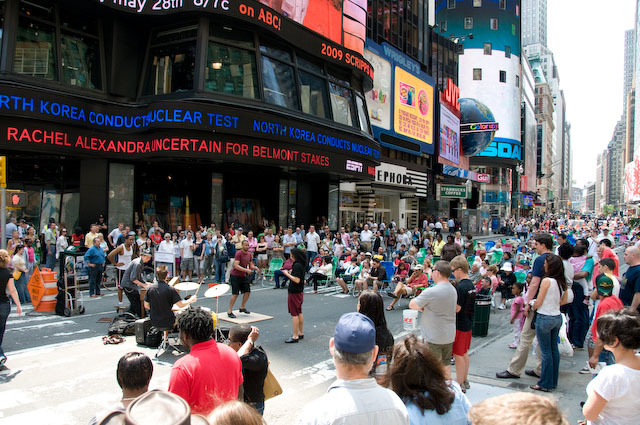 As a result, Times Square became more of a public destination, increasing pedestrian usage and simplifying the flow of vehicle traffic in Midtown Manhattan. NYC now plans to construct a permanent redesign for the plaza. A key similarity between Market and Broadway is that they both cut diagonally through a dense street grid. As many San Franciscans know, if you’re driving on Market, you’re doing it wrong. In fact, Better Market Street surveys show that the majority of drivers on Market only travel two blocks and are looking for parking (which mostly doesn’t exist on Market anyway). Banning cars on most of Market, supplemented with a plan for car traffic flow, could simplify navigation for drivers, who have disproportionate negative impacts on pedestrians, bicyclists, and transit. Copenhagen has also been refining designs on Nørrebrogade, a commercial and transit corridor connecting the city center to the thriving Nørrebro neighborhood. It’s also claimed as the busiest bicycling street in the Western world, with 36,000 bicycles traveling on it every day. Risom said the city downsized an initially longer car-free segment of the street after some merchants complained it would hurt their business. 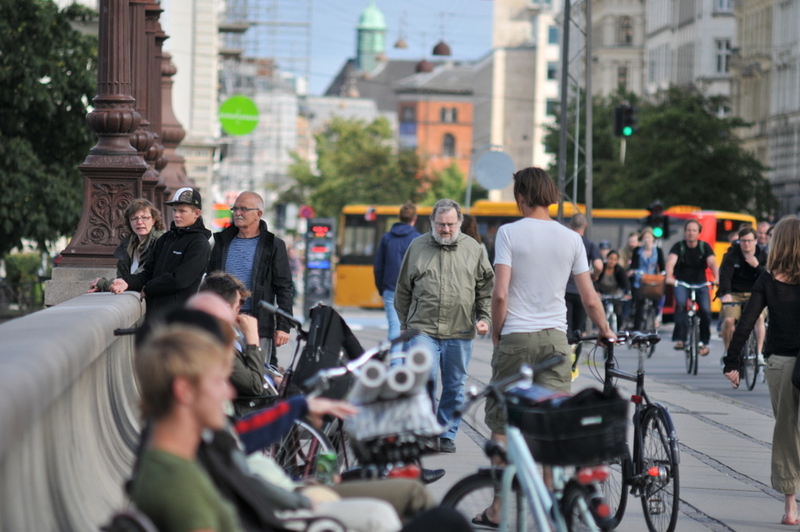 In the last couple of years, a bridge on the street (Nørrebrogade translates to “North Bridge Street”) has become a bustling social destination after noise was reduced by diverting car traffic. The city also used paint to temporarily expand sidewalk space and bike lanes on the street. The city is in the process of making such changes permanent. The current one-block car-free zone “totally changed the whole dynamic of the street,” said Risom. 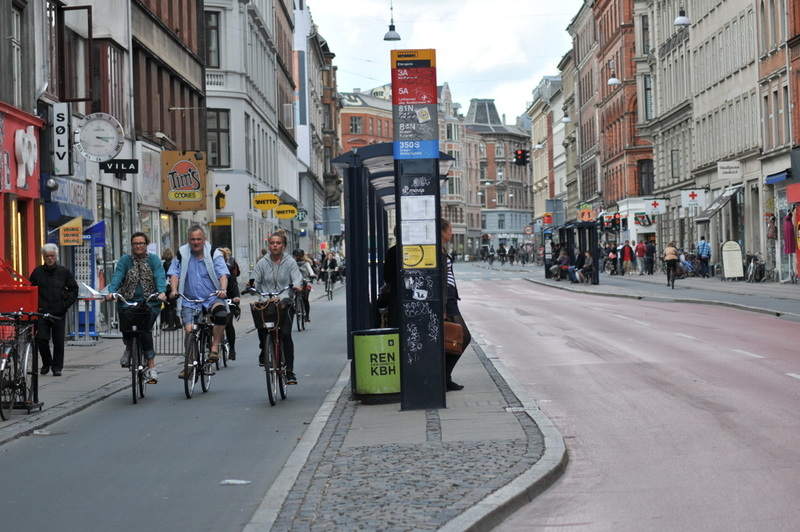 These days, he said, some Nørrebrogade merchants may be regretting their initial push to reduce the car-free zone. 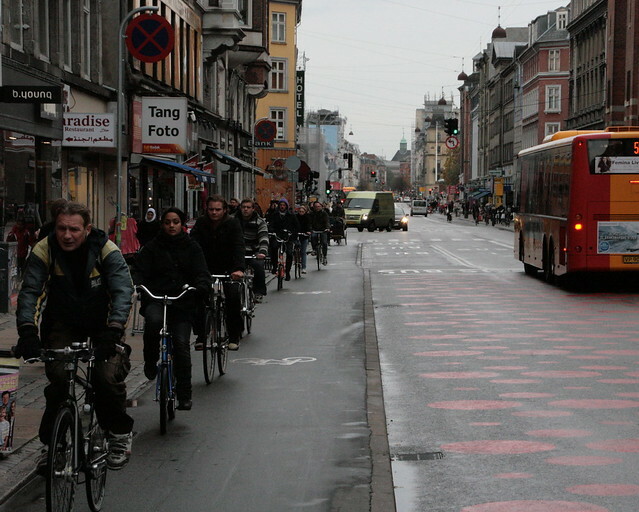 Market could also be graced with physically raised bike lanes, which are common in Copenhagen. Although one proposal would rebuild Market without one, mixing people on bikes with motor vehicles as they are now, there seems to be little appetite for it. Mari Hunter, a bicycle planner with the SFMTA, said attendees raised concerns about how to safely mix bicyclists and motor traffic at intersections with BART station entrances, where space is limited. To speed up Muni lines on the street, the number of center lane stops could be reduced from the current 12 to either six or nine. Members of the SF Transit Riders Union said they haven’t taken a position on either of those proposals yet. The project is scheduled to be completed in 2015. One big question noted by city staffers is where the funding for the estimated $250 million project will come from, as only the funds for re-paving are currently secured. While much of the rest of the funding could come the Federal Transit Administration, one advocate noted the need for a plan to collect fee revenue through upzoned development along Market. For all of the concept materials, check out the Better Market Street website. You can also join a webinar on the project this Thursday, and another public workshop will be held on Saturday. Note: You can read more about some of the principles of urbanism behind Better Market Street from Jan Gehl, head of Gehl Architects, in a series from his book “Cities for People” featured on Streetsblog SF last year. His firm is also working on the redesign of Jefferson Street in Fisherman’s Wharf. Do these other streets have a massive concentration of SROs like we do at Sixth? Any attempt to improve Market that doesn’t take on this problem is just hopelessly naive. Look at what happened at UN Plaza. Cycletracks will solve indigence and homelessness! Hooray for cycletracks! This is getting a bit old. We get it – you don’t like cycle tracks. We’ll try our best not to slow you down. of “residentially challenged” people in the same area. Who, I might add, are San Franciscans just as much as you or I. They deserve to be here. Problems of poverty are not solved by sweeping poor people out of sight. If someone asking you for change is the worst thing that happens to you today you’re pretty lucky. Mark, neither Andrew nor DavisTrain said anything about cycle tracks or bike lanes. What they said is what anyone who spends time there on foot already knows – that there is a huge underclass there who intimidate and panhandle and generally gross out anyone who lingers. If we want to turn Market St. into a pedestrian sanctuary, and I do, then we have to solve the problem of the SRO inhabitants and all their itinerant friends. We’ve made a start with the “Twitter Initiative” but there’s a public safety and public health issue that is the gorilla in the room. I’m pretty sure that there are just as many ‘winos and weirdos’ hanging out at Union Square as at Civic Center. The difference is that no-one else hangs out at Civic Center, because it’s not a very interesting place to hang out- so if you’re of a nervous disposition, you may feel yourself uncomfortable being outnumbered by such people. ‘Winos and weirdos’ aren’t going to go away until the United States adopts sane social welfare and healthcare policies, but the fact that they might be around is not a reason not to improve the pedestrian environment. I think you’re a bit naive about homelessness. The problem with Mid-Market is that for a long time it can’t attract the kind of businesses that can pull people in. Not only the homeless can deter potential customers away, they can shoplift. If a business can choose to locate somewhere else where homelessness is not a big issue, they would go there instead. The few retail/food businesses that can survive there often have security features that make the rest of us uncomfortable to patronize. If the city’s attitude is that “homelessness deserve to be there” then why should it expect the businesses want to locate there? HoJo – Mark was replying to richard, Streetsblog does not have multi-level replies. I am in the camp of “build it they will come”. Lower Downtown in Denver had plenty of winos and weirdos and very little other foot traffic. It was developed into a nicer place in large part by the ballpark as an anchor, and now it’s a very desireable spot. Why look so far flung? The area around Caltrain used to be “not much” and now it’s all that and a bag of chips. Improve the area and the public will appear, and that change impacts how the homeless problem exists in the area. Nice artists rendering, but needs a few more people whizzing to be accurate. The Union Square area in general is pleasant and clean because there’s a business improvement district that provide frequent cleaning. However, the Hallidie Plaza (by Powell BART station) is no different than UN Plaza except with more people passing through. Andy, I don’t pretend to know everything, but I’m not totally naive– I live in the tenderloin and walk up and down market just about every day. Generally we filter out poor people. We don’t notice them as we pass them on the street. That’s much harder to do when there are lots of poor people around– and there are lots of poor people in mid-market. They don’t hurt anybody (obviously I’m generalizing here) whether they’re in Union Square or Mid-Market, but for some reason a lot of more well off people complain about them more on Mid-Market. I submit that that is because they actually see them on Mid-Market. There do need to be businesses in the area to bring in a more diverse group of people. I agree with you on that point. However, vilifying poor people is not the way to bring in those businesses. In short, don’t worry about kicking people out of Mid-Market. Start by bringing more people THROUGH it on foot and bicycle and they will eventually linger. Give them places to linger, even if at first only people you don’t like longer there. I think the people workin on BMS understand that and I have high hopes for the success of this project. Copenhagen actually has a ton of homeless people and street-beggars. People just aren’t afraid of/bothered by them and (thankfully) the city hasn’t started going down the American road of addressing the symptom of the problem by destroying public space like some of the people here have mentioned (and like I see every day in my work in the Midwest). Bikeway on Mission Instead of Market: Does Anybody Think It’s a Good Idea?